Website Ranking: What position does my website have on Google? On which position does my website rank? First, of course! I don’t need to optimize my website. 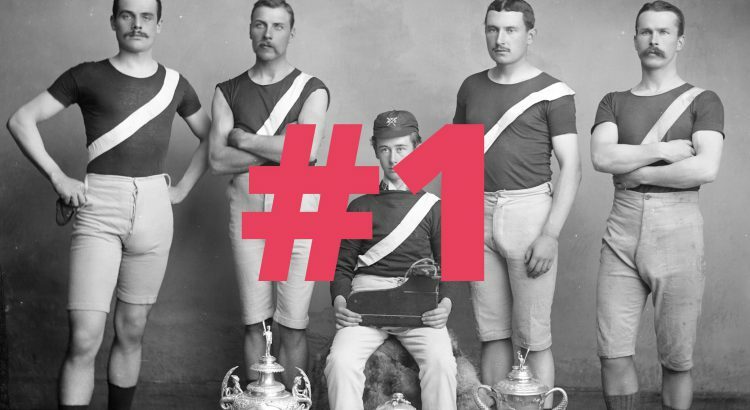 You are probably first, for your branded keyword (the name of your company). And on your own computer. Here is the catch, most probably you are browsing the web, always with the same browser, from the same computer, and you are not cleaning your cookies. If you search for anything on Google and let’s say, click on the third link without visiting the two links on top. Google will learn, and the next time will reorder them for you. After visiting the website, I return to Google, and bang! The order has changed. The website moved to the top position. Google wants to propose the most relevant content for each individual, and it learns from your behavior. 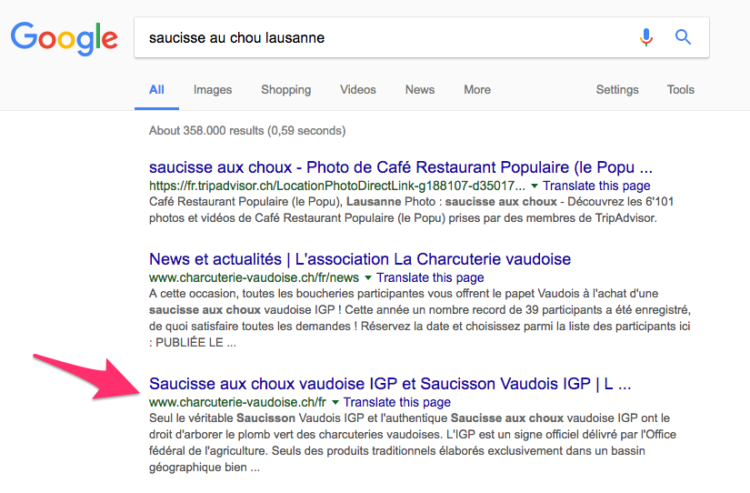 It learned that charcuterie-vaudoise.ch is more important than Trip Advisor for this search query, for you personally, but probably not for your desk neighbor. It is not always instantaneous and doesn’t always work. How to get an objective vision on your ranking? Ok, now you’re confused, but then how can I see what most people see? The first option is to use Private browsing. By doing this, you start with an “almost” blank slate. Your results will still be geo-localized (you don’t see the same results as your aunt 200 km from here). Google does provide some handy information to website owners. 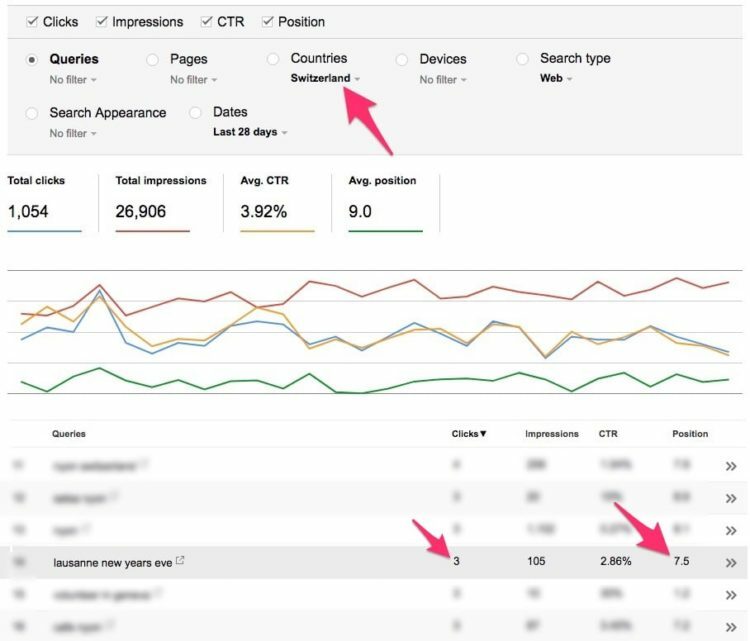 Log in to your Search Console and visit the Search Analytics tab. You’ll need to have a verified property. Follow the onscreen steps if needed. At first, it really only looks like a long list of words with numbers. Then I’ve also selected “Switzerland” in the countries. 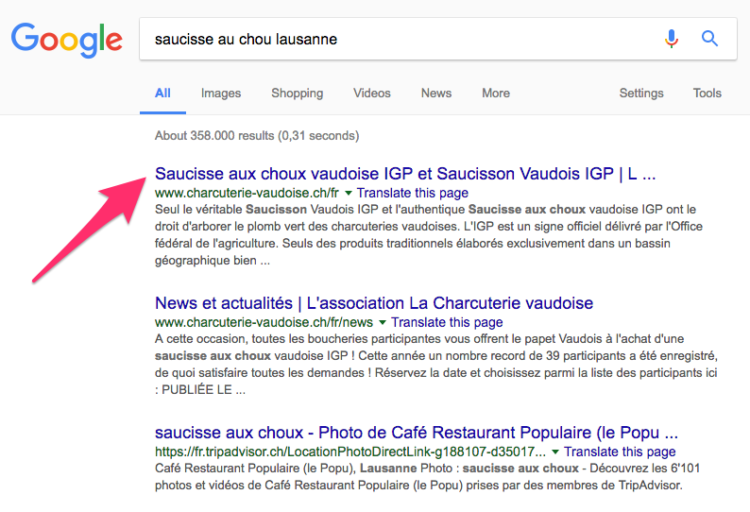 This can have a lot of impact on the position of the keyword. Since you might not rank at all in Kenya, but pretty well in Montreux. Note: Google is rolling out a new version of its tools. The functionalities are similar, the major change is that you can get the data over the last 16 month. I was previously limited to 3 months. With those tools, you can test the position of a specific keyword over time, and see how it’s position evolves. This comes in handy for your most important keywords. Did a competitor just pass in front? Did my blogging efforts pay out and has my page moved from the second to the first results page? A rudimentary tool, the nice thing is that you can see which page ranks first for the keyword you are monitoring. And you’d be surprised, sometimes it’s an obscure PDF hidden somewhere on your site. I find this option more useful. The interface design is better, and you can see the evolution over time for all the tracked keywords. Now your question should be, but which keyword is important for my business? Chances are high that I’ll write a post exactly about this. Make sure not to miss it by subscribing to the newsletter below. Before optimizing your keywords, make sure to have established your Digital Communication & Marketing Strategy. Then you can decide if you should invest time in SEO or maybe just do Search Engine Marketing (Google Adwords).